*Well look who’s playing hardball. It’s none other than Usher Raymond. The singer has made it clear to ex-wife Tameka that he’s selling the mansion she’s been living in since their divorce and she needs to start packing … NOW. 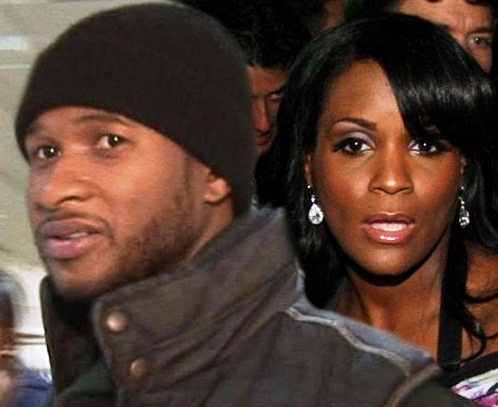 Sources close to the couple tell TMZ, Usher’s lawyer sent Tameka Raymond a letter informing her the 12,000 sq. ft. Georgia home — which Usher owns — is going on the market and she needs to find new digs. Usher has allowed Tameka to live in the home for the last few years — but per their 2009 divorce agreement, Usher has the right to sell the pad at any time as long as he gives 60 days notice. According to sources, Tameka didn’t take the news well, seeing as she has no income of her own and has been financially dependent on Usher since the divorce. On the flip side, we’re told Usher feels he’s given Tameka plenty of time to get her act together … and enough is enough. Whoa, check this out. Tameka has responded, saying thatTMZ got it all wrong … that they’ve been reporting she’d be kicked out for 2 years now and so far they’ve been wrong. @iteachoneofu @tmz They have “reported” this for 2 years now… Slow news day I assume. Pay it no mind. Well, we’ll see in 60 days who’s right and who’s wrong. By the way, if you’re wondering, Usher purchased the home in 2007 for $3 million. It’s unclear what the new price tag will be. Watch him sell it for $1 to be rid of her! He should just quick deed it to somebody and the ho will be gone in no time flat! Yep. Sounds like a case of sour grapes! Usher brought all of this drama and stress on himself, people were advising him not to marry Tameka so I guess he realizes what a mistake he has made. This should teach Tameka and other women a lesson not to depend solely on a man’s money without having some form of income of their own. Apparently Tameka was way too dependent on Usher and his money, now she has to seek a place to live as well employment etc. No! This should teach women not to marry a man for money and expect a big payday in the event of a divorce, it should teach them not to be greedy money hungry chicken heads and expect to live for free. “Welfare mentality” So Tameka get up, get out and get on with your life. What was stated was meant on my part. No problems with any added opinions that may differ. The real truth to the matter it’s unwise for any man, or woman to marry solely based on money. A married couple both should be working to bring something to the table together in lieu of relying one persons income. Tameka was working when she met Usher, and should have remained on her job, regardless of Usher’s financial status. Hmmmm … Could this be another one of the many urban legends surrounding this woman’s circumstances? I’m pretty sure Usher’s legion of fans and the Tameka detractors are aware of the situation where Usher spitefully cut off some card that was being used by Tameka. I believe it was referred to then as just another credit card. It actually was a little more. It was a discount card used by Tameka to get discount on products used for styling her celebrity clients. Yes, the woman was still getting her hustle on, just as she was when she first met Usher. REDS..why in the hell would you come in this camp and state facts? WTF! Don’t you know people aren’t interested in those? I’ve smh each time I’ve read these Tameka “golddigging” discussions because it’s clear people have conveniently forgotten that the thing they once criticized her for, being a “celebrity stylist” is her actual career. Cut it out. No one cares dude. I don’t get these ‘golddigging’ comments either. On the entertainment tonight, Tameka has plans to open up a chain of day care centers. One is already up and running in Atlanta, if I’m not mistaken. Plus, as stated by Reds, she is a celebrity stylist. SMH. You already know what the comments happen. She’s black and a woman whom many felt was never ‘attractive” nor “young” enough to be w/Usher. It never mattered that and and Chili’s age difference from Usher was essentially the same. Yeah, it’s quite confounding when you consider the amount of anger the public reserve for this woman, considering what User did, and even after the loss of her son. Whether or not you want to suspect her of having ambitions of a golddigga, you can’t forget what Usher did to her. He knocked her up twice then dumped her for another woman with no intention of paying any child support. And to think that he actually got away with it, thanks to a system where the wealthy can bribe their way to their desired verdict. Don’t forget that he also cheated. His words..not mine. Yet, women fall all over themselves to blame whom? If the tables were turned?.. You women would be all for it. Right? Mr. Usher has every RIGHt to do what needs to be done as the ex-husband and full custodian of his SONS, period. I just hope USHER had a pre-nup, and if not, spouse support would only be a period of time if the ex-wife is able to work and she CAN so it appears.